It's understandable that Witchery didn't win any awards. Under a low-powered microscope, there are more than a handful of dialogue, logic and continuity problems, and there are some very bizarre performances (mainly Leslie Cummings, although personally, I enjoyed her ineffable weirdness). But as a whole, Witchery is not at all a bad film. It takes the right approach to the budget at its disposal, the premise is good and actually clever at times, it builds an effective if mild atmosphere and the special effects are respectable, even if half of the gore is only implied. Since I feel this film is grievously underrated (it's made it to some "worst films ever" lists) I'd like to primarily focus on the positive aspects. Yes, you can cite brilliant lines of dialogue like one character telling another to get dressed when she's already fully clothed. Yes, you can cite some non-sequiturs in the plot like another character ending up lodged in the chimney. But we all know that a lot of people dislike this film. Let's look at the many things it does right. Witchery's setting and one of the sinister focuses is a small island off the cost of Massachusetts near Boston, and more specifically, a now abandoned, decrepit resort hotel. Local lore has it that the island is evil, and probably haunted. It was the supposed site of witch burnings in the 17th Century and many other rumored strange occurrences have taken place since then. Of course there's more to Witchery than an old building, and in terms of characters, scripters Harry Spalding and Daniele Stroppa remarkably manage to weave at least three distinct threads into a coherent plot. One the one hand we've got Gary and Leslie. They're on the private island illegally, because Leslie is trying to research a book about witchcraft. Gary's there ostensibly because he's going to take photographs for Leslie, but we quickly learn that what he's really interested in is getting her to lose her purity. On the other hand, we've got the Brooks, a motley crew of a family if there ever was one. Mom and Dad have just bought the hotel with plans to turn it into an expensive private club. The only problem is that they bought it sight unseen and are just now getting around to having an architect survey it with restoration in mind. Their kids, Jane (Linda Blair) and Tommy seem to not really be their kids, both because of emotional and script-induced distance and because not only does Jane seem young enough to be a granddaughter, but Tommy seems young enough to be her son. Plus, Jane is pregnant. The oddity of the family isn't a flaw, though. There are many families this non-stereotypical, believe it or not. On our third, Martian hand, we can pick either the "Lady in Black," who inhabits the island, although its never clear if she's alive or just what her nature is, or Linda, the real estate agent and nymphet. Now that might sound like too many elements to work in, but they're all necessary and they're all turned into an engaging story by Spalding and Stroppa. Despite some odd moves, there are nice features like the bookend sequences of Linda Blair in the main corridor of the upper hotel floor. Of course there are a lot of difficult to believe occurrences if we were to try to fit the story into the actual world, but this is a horror film about witches and Satan and all kinds of supernatural things. Witchery never breaks character with that, and in addition to the wonderful supernatural features, much of the film is grounded in the actual world, such as the motivations and behavior of the human characters, in spite a few lines of bad dialogue here and there. 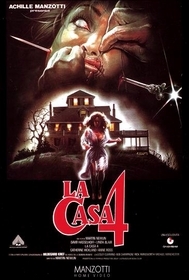 One of the many intelligent moves made by Witchery directors Fabrizio Laurenti and Rob Spera is the setting of the film. The isolated nature of the island is an ideal aid in atmosphere and tension (and somewhat resembles a later, similar device in I Still Know What You Did Last Summer, which may owe more than a nod of the head to Witchery) and the Laurenti and Spera manage to make the hotel seem very creepy, despite its overall Fort Myers, Florida retirement-home-aura. Due to this subtle feat of direction, Witchery often plays more like a good haunted house yarn-the phantom tub, the self-powering film projector, the subtle door openings and closings, the weird voices, etc. are all obvious instantiations of this. There's also an obvious advantage to the abandoned hotel setting in terms of budget. And the budget they saved in choosing a prime location for 80% of the film was wisely spent on the surreal, enjoyably twisted horror/torture sequences. The effects and make-up in these scenes, while maybe not anything to get KNB and Tom Savini out of bed at 2:00 a.m. for, are gruesome enough, and the great direction milks every cent out of what they have available. It may be sacrilegious to suggest this comparison, but the surreal sequences in Witchery play like what Hellraiser 2 might have been like on a sixth (and sixty-sixth) of the money. Witchery isn't something to analyze as an example of the best in scriptwriting, of course, but it's certainly no Night of Horror (the Tony Malanowski film) either. The story is decent, the performances are passable, and the direction, effects and cinematography are above average. Besides, you get to see Linda Blair do a bit of that demon thing again.